Never pass up an opportunity to learn and grow no matter how much pressure you get to stay a bystander. I was nervous to compete in my first powerlifting competition. I had many people try to put down my dream and tell me I was making a rash decision. They told me if I was serious about my training I would have paid a trainer to teach me or paid 150 dollars a month for some ritzy gym. What they don’t know is I have been serious about weight lifting for over two years now. The objections, “you could really hurt yourself” or “wow you must emasculate so many guys” simply became background noise to me. Some oppositions even fueled my preparation and helped me train stronger and smarter because I wanted to prove them oh-so-wrong. It also helps having spent years networking online building my online turned real life fitfam. These people have become a wealth of knowledge throughout my fitness journey. They have helped me find strength plans online or have given me weights, splits and reps to work with to meet my goals. My first meet was the Shenandoah Open Raw Bench Press-Deadlift Championship. Although I only competed on one lift and it was unsanctioned it was a great way to get the feel for a meet. I was shooting for a PR at the meet and I went in and did exactly what I was hoping for. I lost weight for the meet as I expected to do and competed at the 123 lb. weight class but ended up weighing in at 120 lbs. Even though I weighed a little less than I wanted to I was still able to pull 285 lbs. as my final attempt for a new deadlift PR! The meet also allowed me to key in my training and really focus on improving my deadlift, form, grip and strength. At my next meet I plan to complete a full powerlifting meet competing on deadlift, squat and bench. My bench and squat need a lot of work but I know if I work hard and train properly I will be amazed at the results. Are you looking for a list of which pumpkin products to buy and which to dodge? Here is a pretty solid break down of the pumpkin products I’ve tried so far and my thoughts about them as described by my real life gym analogies. The pumpkin products I like are listed from most desirable to least and the ones to skip are listed in order of most disappointing first. Considering the low calorie nature of this ice cream it is still super creamy and delicious. I kind of wish it had chunks but I love the flavor so much that it doesn’t really phase me. This is my favorite in a waffle cone! These cookies are pumpkin shortbread cookies dipped in a vanilla yogurt topping with festive sprinkles. They are a cross between: shortbread, Keebler frosted animal cookies and pumpkin pie ginger snaps. (Is that a thing?) They are so good that I had to portion them out into mini serving size bags for portion control. This gelato is super rich and pumpkin spice-y. It has little chunks of pie crust throughout but not nearly enough to make it strides better than the slow churned Edy’s version. I really love this gelato but I could easily replace it for the more macro-friendly Edy’s. Awesome snack and finger food! These definitely taste like pumpkin but could have a little bit more of the spices involved. They are a good volume food too because you can have a lot of them for little calories and not much sugar. This probably has the best pumpkin flavor out of the cereals I’ve tried. My one lament is that they get soggy in milk fast. I really like this rich and creamy yogurt. The pumpkin ribbon in the container just screams fall. It was not really as sweet as I imagined it to be but is perfect when you add just a bit of honey. Pumpkin Spice Yogurt by Oh My Yog! I love the Oh My Yog! line so I had to try this flavor. The bottom has an oasis of ooey-gooey pumpkin filling. This yogurt is awesome and even better topped with walnuts. I ranked this under the Noosa because it is not as creamy. When you heat up this cookie in the microwave for 12 seconds it tastes just like pumpkin bread. I ranked it low because it is expensive, each cookie is 2 servings and they are not an everyday treat. This was honestly the biggest disappointment ever. The packaging is so misleading. When I picked it up at the store I was so excited to try it. I pictured what I would taste to be the creaminess of eggnog with a hint of pumpkin spice but when I poured this into a cup I was left with tasteless but thick almond milk. Sure it was orange but where was the pumpkin flavor? I even tried this hot and continued to be less and less impressed. Swerve this like the plague. Don’t even get me started on “Pumpkin Spice” Special K. I tried it and sure it tasted like cinnamon, ginger and maybe even nutmeg but not pumpkin at all. They did not even bother to make the cereal orange and nowhere in the ingredients is the word “pumpkin”. Kick this fraud to the side. Hey world, why would I need these? I tried these because I got them as a gift. I know some people like chocolate and pumpkin but putting these in hot cocoa felt downright wrong. Putting them in S’mores felt like a mistake. After having them sit on my shelf for almost a year I tried one on its own and decided to retire them to the trash. I tried these at a training event and was sorry I even picked them up. They are little sponges disguised as muffins. The pumpkin flavor also wasn’t there for me. NEXT. These are not bad they are just too strange to be my favorite. I rarely ever crave pumpkin and chocolate together but if you do you’d LOVE these! They have a soft caramel pumpkin center. Have you ever had a pumpkin product that was a major let down? What is your favorite pumpkin spice item you’ve tried? Was it one of mine or was it different? It is important to maintain a steady intake of micronutrients in your diet regardless of if you are eating in a deficit, surplus or at maintenance. Macronutrients consist of fat, carbs and proteins while micronutrients are only necessary in tiny amounts. Micronutrients are critical for your body to function properly. They can be taken in capsules but yield significant benefits when eaten in their raw form as fruits and vegetables. Below are easy ways to sneak micronutrients into your diet everyday! 5. Always add fresh or frozen fruit on top of protein pancakes, waffles or French toast to add exciting texture, flavor and fiber! 8. Make spaghetti squash at the beginning of the week so you can throw some sauce and protein on it and voila virtually carb free spaghetti! What is your favorite way to add micronutrients into your diet? How do you sneak fruits and veggies into a picky eaters pallet? Comment to let me know! We all know that it is not necessary to put your full make-up or try extra hard to put your hair in the perfect ponytail in order to have a killer workout. However, picking out clothing for the gym that you are excited to put on can affect your mood and even push you harder in the gym. Putting on bright colors right before my workout re-energizes me and helps me get pumped. I love that in the gym my workout clothes can be as “loud” as I want them to be. I can wear colors and styles that I cannot wear at work or out on the town. There are days when I am running low on clean clothes and I am forced to wear a super bland outfit I’m not crazy about. When I have those days I am less motivated, less confident and less likely to do that extra rep or run that extra mile. Weightlifting and wearing bright/fun workout clothes make me so happy and up for a challenge. If you are one to normally wear a lot of blacks and greys, I urge you to start adding bright colored pieces to your workout wardrobe. I started using this app called “Stylebook” to plan out my outfits using my actual clothing. I used Stylebook to create the outfit below. I will probably write about Stylebook in a future blog post because I love it so much! Have you seen a change in your motivation to work out since adding bright colored clothes to your gym ritual? Do you love wearing bright workout clothes? Let me know your thoughts on this topic below! Which exercise do you absolutely dread? My challenge to you this upcoming week is to really think about the answer to that question. Which exercises really challenge you? Is it running? Is it decline push-ups? Start seeing that weakness as an opportunity to challenge yourself rather than shy away from it. For me those difficult exercises are pull ups, push-ups, dips and even burpees. Commit to performing a certain amount of your problem exercises every time you work out and they will eventually become a hell of a lot easier and I guarantee you’ll feel stronger. Recently, I’ve been experimenting with improving my push-up stamina. The way I’ve been doing this can seem a little crazy. When I feel like pushing myself a little extra I will perform a week of 100 push-ups a day. Usually I complete them in sets of 10-15. It is easier to meet my push-up quota on days where I work out because I simply add in the sets here in there to my normal supersets. Overall my push up challenge wasn’t extremely difficult to complete, it definitely made me stronger, gave me a great pump and the satisfaction of overcoming my weakness. Since then I have completed it three separate times. It is important to note that you should have weeks off from this program to recover and grow the target muscles. During the push -up challenge be aware that you are working your chest and deltoids into overtime so make sure you are listening to your body when chest and delt day come around. You can also perform any other problem exercise in place of pushups but depending on which exercise you select increase or decrease daily reps accordingly (Ex. Pull ups I would shoot for 3 sets of 6 reps daily, trying to get as many unbroken as possible…etc.) Please join me in this weekly challenge starting next Monday and let me know how it goes!! Coconut water naturally supports hydration. It is my favorite drink to rejuvenate me after a long weekend or after a hard workout. Due to the high potassium levels coconut water can reduce blood pressure because it lessens the effects of sodium. How do I choose the right coconut water? With so many coconut waters appearing on the market this can be overwhelming. Obviously the best choice is to buy all organic coconut water that is raw and organic such as the one from Juice Press. Although, I’m balling on a budget so I am going to have to settle for something more affordable. Below you will find how to differentiate between the good and bad. Plain coconut water? So this must always be just straight up coconut water? That isn’t always the case. The ZICO brand coconut water is just coconut water while the Vita Coco version has a tiny bit of sugar. The difference in sugar grams between the two is only 2g which is very minimal. So I am assuming that 2g is the only amount of added sugar in the Vita Coco. Another plain coconut water without added sugar is O.N.E . Watch out for coconut waters with sugar listed in the ingredients. Ideally look for one’s with natural flavors and sweetened with stevia not concentrate or sugar if you are looking for a low carb option. ZICO Watermelon Raspberry Flavored Coconut Water is a good option because it is sweetened only with stevia. Taste wise my favorite is Vita Coco’s Peach and Mango coconut water. The ingredients are only fruit purees and coconut water so although this is higher in carbs than the stevia flavored one at least the carbs are not coming from refined sugars. ZICO coconut water like most contains as much potassium as a banana and contains 5 electrolytes. ZICO coconut water is also a non-GMO product. This is a truly unique coconut water. Unlike any I have ever tried. This coconut water is so creamy it is pretty hard to believe it contains no dairy. It is a tasty blend of 80% coconut water, chocolate flavor and coconut cream. Lets not forget it also contains 5 electrolytes! I think this one is my favorite although some of the other flavors are lighter and more refreshing. I like that the fruit flavors here are not from concentrate. They are of natural origin and there is no sugar added in this product. The sweetness of it comes from natural Stevia extract without refined sugar. This flavor is sweet but definitely a refreshing change from water. This would make an ideal poolside drink. I liked the pineapple flavored coconut water but it was not as sweet as other varieties I’ve tried. I tend to like the sweeter pineapple coconut waters because I feel like they taste more reminiscent of a piña colada. I am not normally a fan of plain coconut water but this one is pretty good. I still prefer to mix it into all fruit smoothies however. Although you can rest assured that it contains only one ingredient, coconut water! Let’s face it BBQ sauce and ketchup are amazing but I try to avoid them to minimize my intake of corn syrup and to avoid the calories that these condiments traditionally add to meals. It turns out I no longer have to shy away from my favorite condiments. 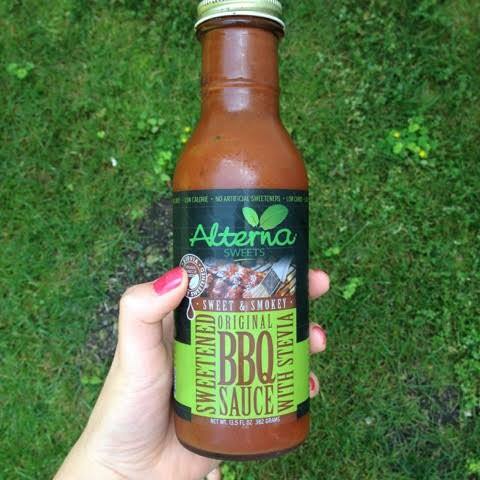 I was amazed to find a company that offers healthy and natural versions of both BBQ sauce and ketchup. 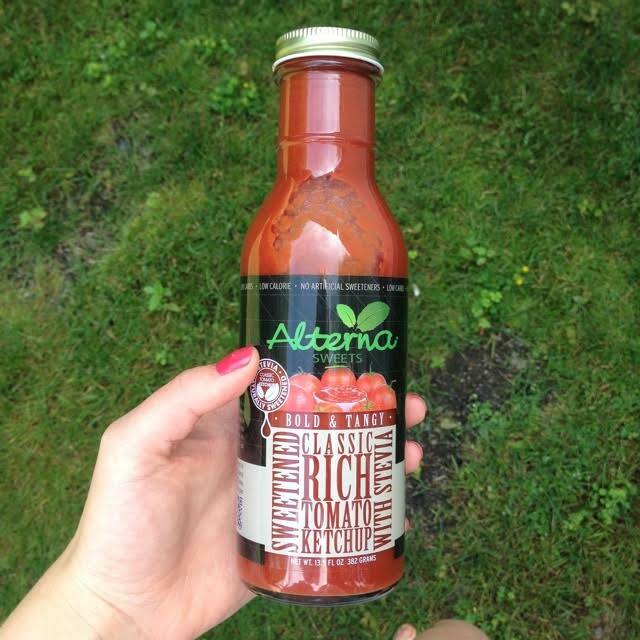 AlternaSweets are unique condiments in that they are extremely low carb, low calorie, delicious tasting and natural. Most diet friendly alternative condiments are packed with sodium, artificial flavors and fillers while AlternaSweets condiments are not. AlternaSweets is only sweetened using the stevia plant and is made out of simple natural ingredients that you can actually pronounce. 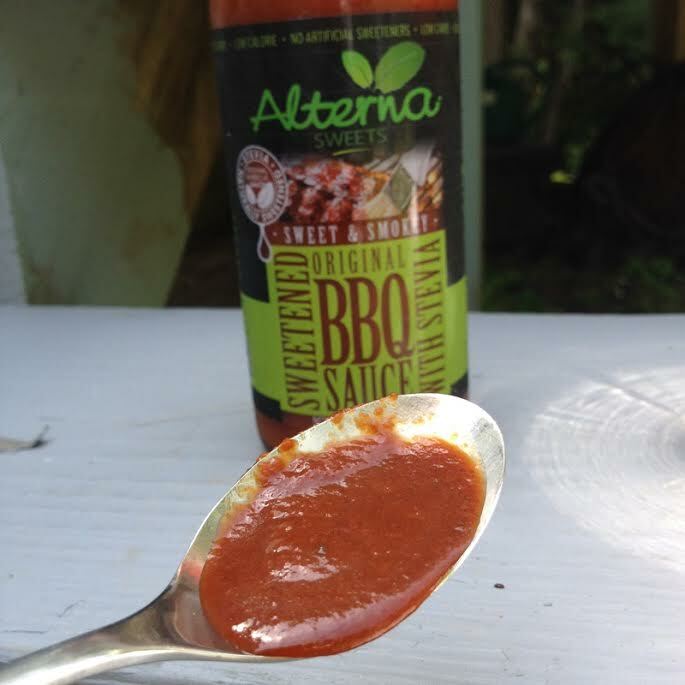 AlternaSweets was kind enough to let me try a bottle of both their BBQ sauce and ketchup. I love both of the condiments but if I had to choose the BBQ sauce is an absolute must have and has become a grocery staple in my household. It satisfies the cravings of everyone even Stevia haters. This BBQ sauce is amazing. In fact my father still doesn’t even know it’s healthy. Let’s keep this our little secret okay? The smell is amazing. 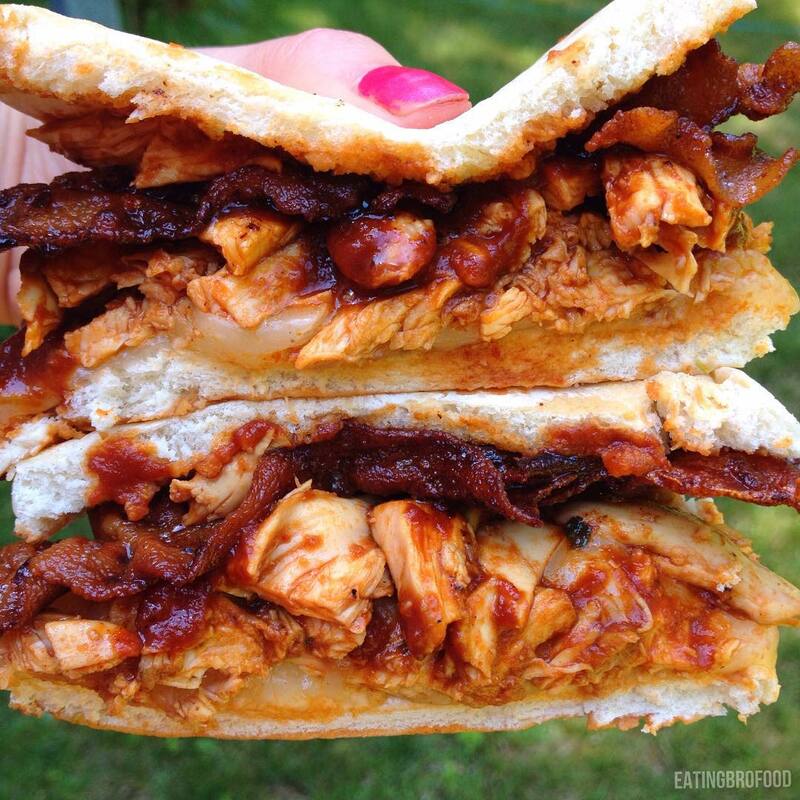 The texture is thick as a BBQ sauce should be. The taste is smoky and sweet and not spicy at all. Kids and adults alike would rave over this sauce. 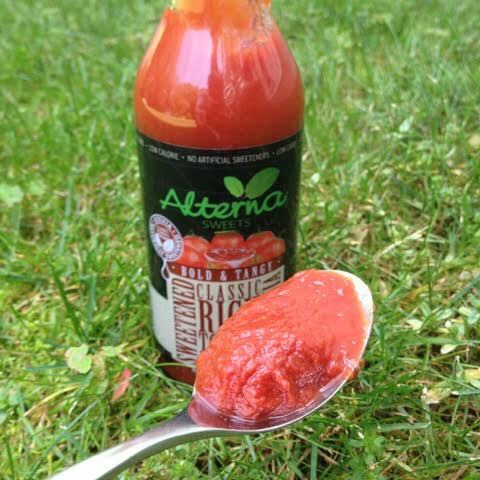 The AlternaSweets ketchup is the most natural close to reality ketchup I’ve ever tasted. Look how chunky and unprocessed it is! I imagine this is how homemade ketchup should and would taste. It is honestly tomatoes in a bottle with a little stevia added for sweetness. What a wonderful sidekick for French fries this is. Overall, I would recommend anyone buy these condiments you will not be disappointed. Your family will be nourishing their bodies without even knowing it. Don’t forget to follow AlternaSweets on social media!